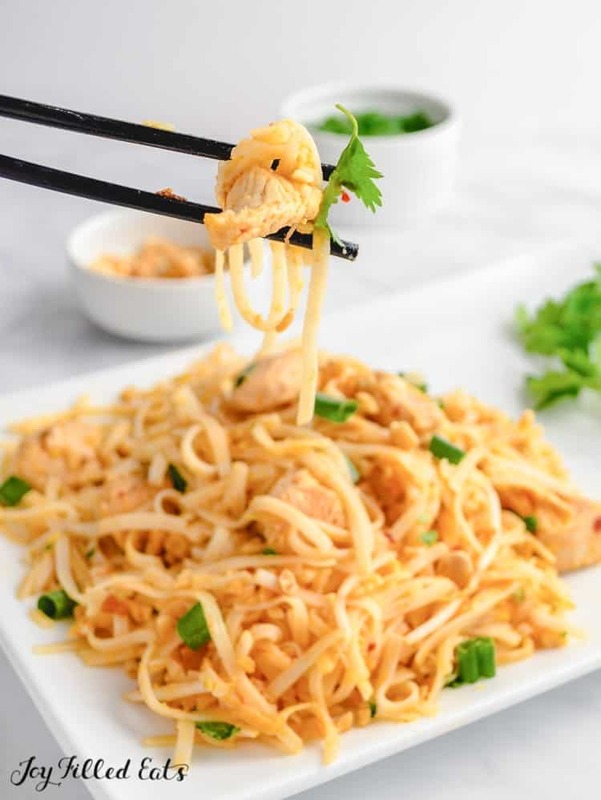 Keto Chicken Pad Thai has all the flavors of the traditional rice noodle dish but with just a fraction of the carbs! 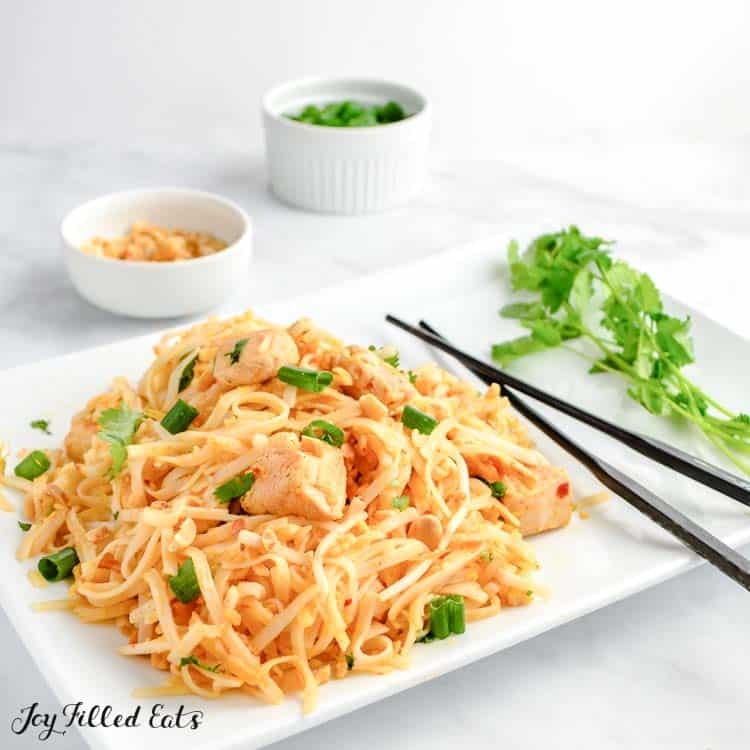 An authentic and flavorful keto chicken pad thai! Sweet, sour, salty, and spicy, this pad thai will hit all of your taste buds. A super easy meal for 4 and ready in just 30 minutes! Hey there! This is Kailey from Living Fresh Daily. I’m super excited to be sharing my keto pad thai recipe for my first guest post. It’s quick, easy, and full of flavor and is one of my go-to recipes for those busy nights. Why order takeout when you can have an authentic and delicious pad thai ready in just 30 minutes? Make sure to try these Rainbow Spring Rolls too! What Noodles Do You Use For A Keto Chicken Pad Thai? 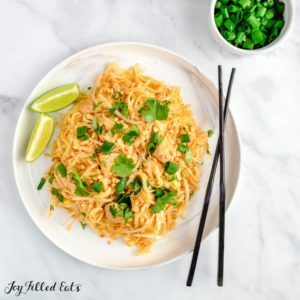 I use Shirataki noodles (aka miracle noodles) for my keto pad thai. These noodles are popular in Asian dishes and are made from ground konjac yams. If you haven’t heard of Shirataki noodles yet, then let me introduce you to your new best friend! Shirataki noodles are 97% water and 3% fiber and that means they are 0 net carbs per serving and near 0 calories per serving. They are the perfect weight loss noodle. Where Can You Buy Keto Pad Thai Noodles? Shirataki noodles might seem like an obscure ingredient, but they’re actually pretty easy to find! Any world market or Asian market will have them. They are also becoming increasingly available in health food grocery stores like Whole Foods or Trader Joe’s. I even saw Shirataki noodles at my local Walmart! 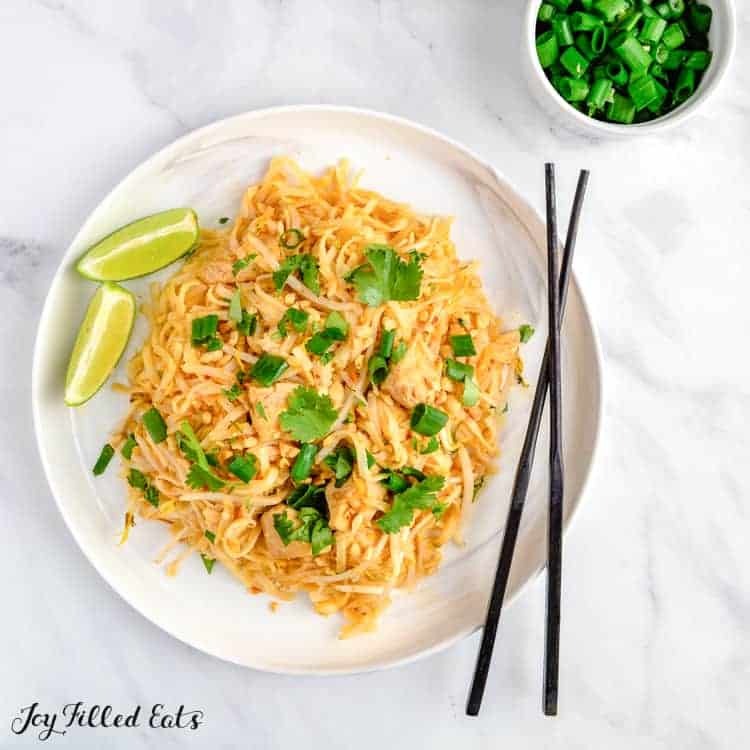 Shirataki noodles are virtually tasteless which makes them perfect for the flavorful sauce in this keto pad thai. The noodles come in a package with water and when first opened you might notice an unpleasant odor, but fear not! Simply drain then thoroughly rinse the noodles to remove the odor. Cook the noodles in a wok or pan with no oil to completely remove the excess water and to give them a more familiar noodle-like texture. Start by washing and drying the fresh produce. Thinly slice the scallions, keeping the white and green parts separate. 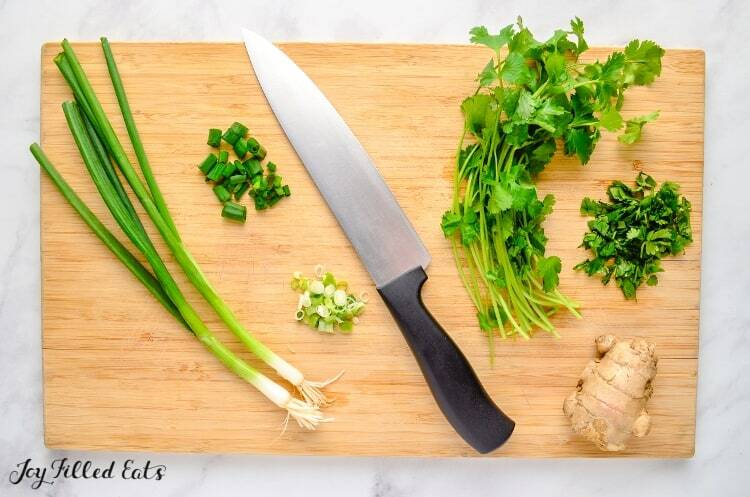 Remove cilantro leaves from the stems and give them a rough chop until you have about 1/3 cup. Peel and mince garlic and ginger. Butterfly the chicken breasts in half to make them thinner and then cut the chicken into bite-sized pieces. Depending on the thickness of your chicken breasts and your personal preferences, you can skip the butterflying, but I find it gives the chicken a more traditional pad thai feel and helps it to cook faster. Add the fish sauce, rice vinegar, peanut butter, coconut aminos, lime juice, and stevia to a small bowl. Add up to 1 tbsp of Sambal Oelek (or other chili paste) depending on how spicy you like your pad thai. Whisk the sauce together until smooth and well combined. *Note: You can substitute soy sauce for the coconut aminos. They have a similar flavor, but I prefer the added sweetness that the coconut aminos provides. Heat a wok or large pan over medium-high heat. Add a drizzle of oil (I used sesame oil), then stir fry the minced garlic and ginger for 30 seconds, or until fragrant. Stir continuously so that the garlic doesn’t burn. After 30 seconds, add 1 tbsp of Sambal Oelek and the sliced scallion whites. Continue stir frying for 2-3 minutes until the scallions have softened. This base is packed with flavor and allows us to get away with a lighter (and lower carb) sauce while still keeping the dish flavorful! Once the base has cooked, add the chicken to the wok or pan and stir fry with the keto pad thai base for about 5 minutes, or until the chicken has seared on the outsides and cooked through. While the chicken cooks, beat two eggs using a whisk or fork until well combined. Drain and thoroughly rinse the Shirataki noodles with hot water for about 2 minutes or until their package odor is gone and they have a bland/tasteless flavor. Once the chicken is done cooking completely empty the chicken/base mixture from the wok and set aside. Add the noodles to the empty wok (without using any oil) and dry fry them over medium-high heat for 5-7 minutes to remove all excess water. You want the noodles to have a firm and noodle-like texture. Be careful not to overcook the noodles or you will lose this texture. Once the noodles have cooked, stir in the beaten eggs and scramble/stir fry them with the noodles until they are cooked, about 2-3 minutes. Once the eggs have cooked, add the chicken/base mixture back to the wok with the eggs and noodles. Add the bean sprouts and stir in the pad thai sauce. Continue stir-frying and mixing for 2-3 minutes until everything is well combined and heated through. Top the keto pad thai with the scallion greens, cilantro, and chopped peanuts. Enjoy! There you go, a super easy and delicious keto chicken pad thai all in under 30 minutes. It makes 4-6 large servings so you have enough for the whole family + some extra leftovers! An authentic and flavorful keto chicken pad thai! Sweet, sour, salty, and spicy, this pad thai will hit all of your taste buds. A super easy meal for 4 and ready in just 30 minutes! Wash and dry fresh produce. Thinly slice scallions, keeping whites and greens separated. Peel and mince ginger and garlic. Roughly chop cilantro leaves. Butterfly the chicken breast then cut into small bite sized pieces. 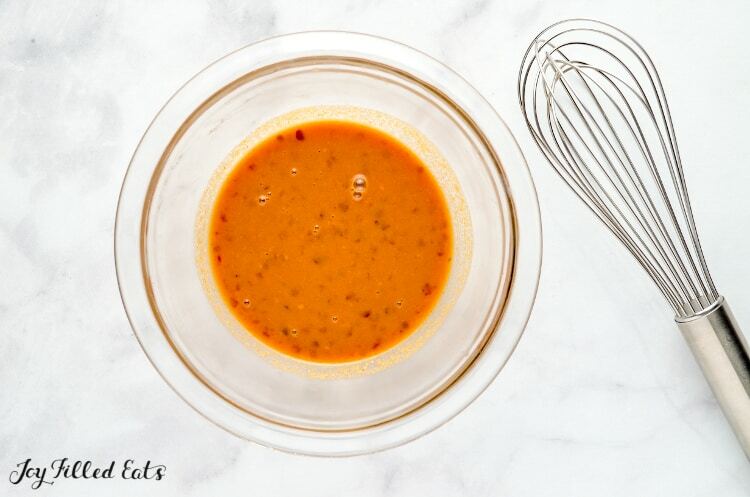 In a small bowl, whisk together all sauce ingredients until well combined and smooth. Heat a drizzle of oil (I used sesame oil) in a wok or large pan over medium high heat. Add ginger and garlic and stir fry until fragrant (about 30 seconds), stirring frequently. Add scallion whites and 1 tbsp sambal oelek to wok with ginger and garlic and continue stir frying until scallions have softened about 2-3 minutes. Once scallion whites have softened, add chicken to wok with the ginger, garlic, scallions, and sambal oelek. Stir fry chicken for 5 minutes or until lightly browned and cooked through. While chicken cooks, beat 2 eggs until well combined. 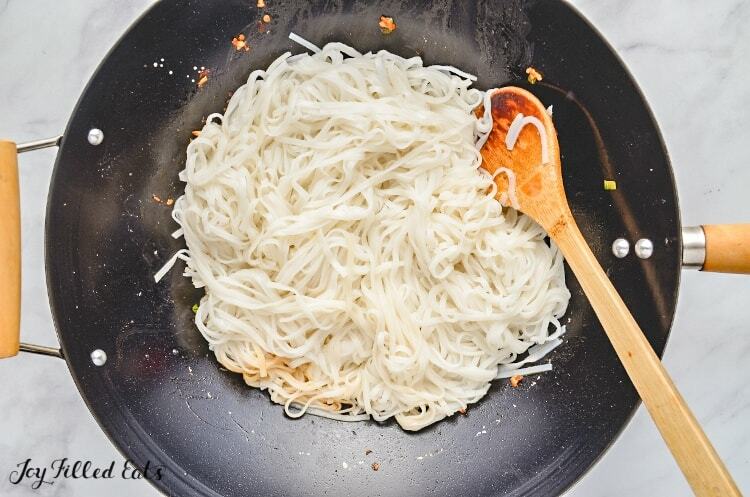 Drain and rinse shirataki noodles thoroughly under hot water for about 2 minutes. 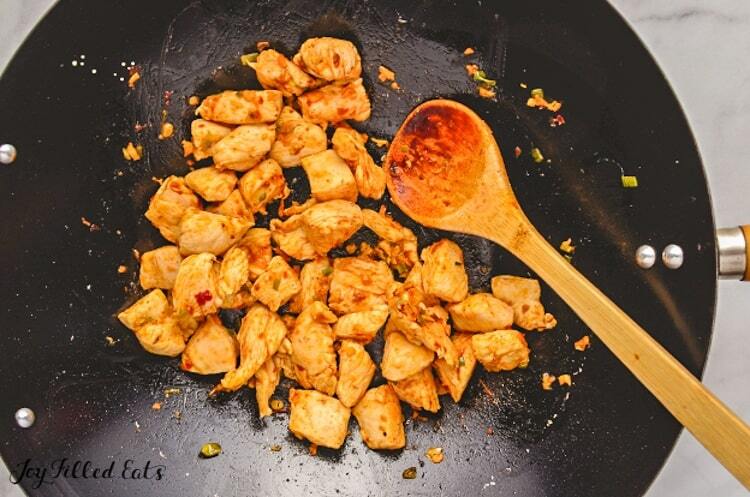 Once chicken has finished, remove the chicken stir fry the wok or pan and set aside. Add shiratki noodles to the wok and stir fry noodles until firm, about 5-7 minutes. Once noodles have cooked, add the beaten eggs to the wok with the noodles and stir fry for 2-3 minutes until the eggs have cooked. Stir frequently to break up/scramble the eggs. 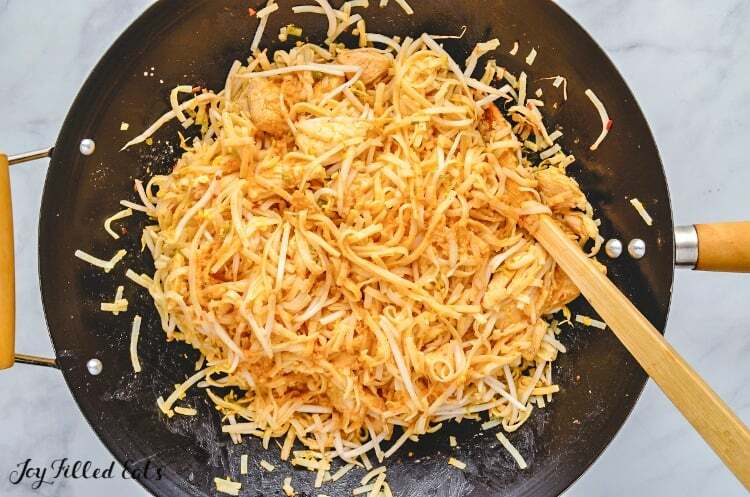 Once eggs have cooked, add the chicken stir fry, pad thai sauce, and bean sprouts to the wok. Continue stir frying for about 2 minutes until all ingredients are well combined. Top with scallion greens, crushed peanuts, and cilantro to serve. Enjoy! What is actual weight of a serving. I'm sorry, I don't have that information. You could weigh the whole batch and then just the weight by 4. I just scoop equal portions in 4 bowls. I love Thai anything and this was sooooooo good. Will definitely make again! I love getting Thai takeout. This looks just as tasty, but much healthier!